It looks like a warming trend for next week. The river has had very little fishing pressure over the past couple of weeks, with good numbers of Steelhead in the upper sections. Croton Dam to Thornapple have been fishing the best. Trout beads, jigs with wax worms, and spawn continues to fish well for us. Steve with a gorgeous buck Steelhead from the Muskegon River near Newaygo. Trophy Spring Steelhead Fishing. Brandon with a plump hen from the Muskegon River. 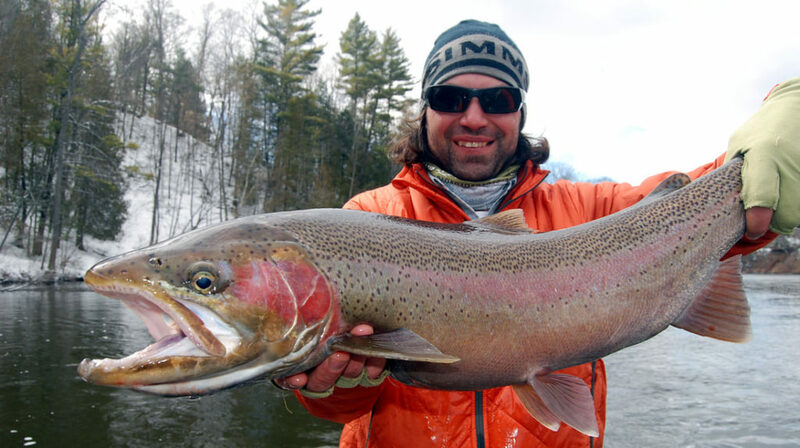 Warmer weather ahead – Should make for some great Michigan Steelhead fishing! Michigan Fishing Reports – Spring Steelhead Fishing has been going strong on the Muskegon River. Bright Silver Steelhead have been throughout the mainstream, from the Croton Dam through the Newaygo area. Trout beads & small spawn sacks have been fishing well on light spinning tackle.Spinning Tackle Float fishing has been the best lately. Drifting Trout beads, spawn sacks, or jigs with wax worms has produced the most Muskegon River Steelhead. Carl getting a couple while Fly Fishing the Muskegon River. Fry patterns have been fishing well. Trophy Brown Trout from the White River in Arkansas. It’s warm there during the winter, with incredible trout fishing! We also have Winter reservations available for the White River in Arkansas for January 5th – March 15th for Trophy Brown Trout and Rainbow Trout. Steelhead seem to be a bit larger this season, healthy, strong fish in the Muskegon River. Lots of bright chrome Spring Steelhead throughout the Muskegon River. Lots more to come! Bright Chrome with more on the way! Spring Steelhead just now starting to show in numbers. Fishing should remain strong on all the West Michigan Rivers. Trout fishing is very good during the Winter months on the White River, Arkansas. Trophy Brown Tout fishing during the winters months, where the weather is warmer, and the trout fishing is World Class for big Browns and plentiful Rainbow trout. Steelhead fishing has been very good over the past week. We received a bump in the water levels today with the recent rain. That’s a very good sign. Higher water levels should pull a few more Steelhead from Lake Michigan. The Manistee River is coming in strong so far this season. Tippy Dam seems to have a lot of Fall Steelhead right now! Water conditions have been near perfect to bring in the chrome. Tippy to High Bridge is fishing well due to the concentration of spawning, nearly dead Kings. Trout (bead ) fishing has also been excellent this year below Tippy Dam. Color selection has been the key to unlocking the steelhead. Custom beads have fished the best. Muskegon River is a little bit behind but doing alright. Steelhead fishing during the morning has been good. A bump in the water levels would certainly help. Might Mo is running low and gin clear. Most of the Steelhead are parked in the upper section, Croton Dam to Thornapple has been the best. Down Low – Bridgeton to Maple Island have been good a times but mostly hit or miss. Rain would certainly change that. Look for Steelhead fishing in Michigan to improve over the next week or so. Fall Steelhead want to move so the next bump in the water levels should bring in the masses. Rain will help the process. What’s Working Best? Beads, Beads, and More Trout Beads have been the best. Small spawn sacks in lighter colors have been working well. Casting cranks, or the swung fly, both picking off aggressive biters. Bead fishing with spawn is definitely a guide staple for the colder months. Steelhead fishing has been excellent. Guided Fall Steelhead Trips are ALL INCLUSIVE on the Muskegon River and Big Manistee. We offer both Full and Half Day guided fishing. Full days ($395) begin around 8am – 4pm. Half Days ($295) are now available during the morning or afternoon. We allow our clients to keep (3) Steelhead per day. Fish Cleaning is included in your trip. All Gear, Tackle, Bait, and Flies are provided at no extra charge. Look into the Michigan fishing reports! We have created a dedicated page to update all lists of successful stories covered by our enthusiastic customers in Michigan River. We have detailed report to traverse through the entire journey, narrated and described in own words to connect you. For sure, this report will help others in choosing the right time and best practices for fishing in Michigan River. Not all season are ideally fit for fishing in Michigan River, only particular time and month of the year gives you treasure of happiness. If you wish to ace fishing extravaganza, then feel free to check into our Michigan Fishing Reports for guides and real-time experience., with updated fishing reports. Betts Guide Service provides you complete fishing guidance and support service for an affordable price. We are trusted for offering successful fishing tours on Michigan River, making us the number one choice for interested anglers to have a great time! Salmon, Steelhead, Trout, Spring Steelhead, Smallmouth Bass, and Atlantic Salmon are few are our customer’s favorite fishing. With our expert fishing guide and fishing tools, you can ensure successful fishing on famous Michigan Rivers such as Muskegon, Manistee,Pere Marquette , Grand, White and Au Sable River. We manage eco nature tours in the wilderness of Michigan landscape. Where to fish, when to do fishing, how to make way for assured success and questions related to our services are solved at Betts Guide Service. Whenever you sign up for our fishing guide service, we update it our Michigan fishing Reports. Your testimonial will be an inspiration for next customer. We are your one-stop solution to all your fishing services. Come and join us. Before booking our guide service, check into recent Michigan Fishing Reports for some awareness if you are new. Make sure you always have the best fishing experiences with us that you can share proudly with your family and friends.